She is, without question, the preeminent actress of our time. Meryl Streep has tackled a vast gamut of roles since she made her movie debut in Julia, in 1977—everything from a Manhattan divorcee in Kramer vs. Kramer to a Holocaust survivor in Sophie’s Choice to Margaret Thatcher in The Iron Lady (to name only the parts for which she’s won Oscars.) This year, she expanded her range yet again, playing a witch in the film adaptation of the Stephen Sondheim musical Into the Woods. (Meryl sings!) 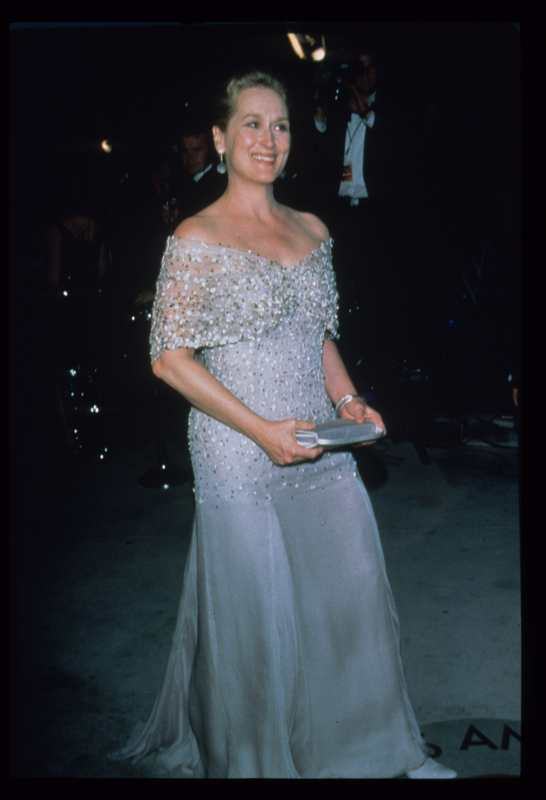 That part nabbed Streep her 29th Golden Globe nomination. Of course, no history of Mr. Valentino’s relationship with Meryl Streep can fail to touch on the moment when their professional lives intersected in the most visible of ways. One of Streep’s most indelible roles was that of Miranda Priestly, the frosty fashion editor in this film The Devil Wears Prada. Mr. Valentino had a cameo in the movie—also starring another great friend of his, Anne Hathaway—and briefly performed opposite Streep. They were both acting, but the respect and affection onscreen was anything but feigned.